IT'S THAT YOU HAVE to look at it, day after day. Most people get up, do their thing and walk out to their car or truck. Maybe it has a place of honor in a multicar garage or maybe it sits bereft in a parking deck as gray as the skies. But there it is. Every morning, the moment recurs when we possess our automobile all over again. That's me, that's my ride. Turdblossum. "Man, I need a new car," you think. Which means you have to go to a dealership, which also means you get to be a schmuck. It can't be helped. The following paragraphs constitute all I know about the retail car-buying experience. Consumers make the process needlessly antagonistic and stressful. People come into car dealerships in fits of near-delusional paranoia, convinced that everybody's trying to rip them off. They will wave a printout from Edmunds.com or Kelley Blue Book like it was a machete. They will scream and throw themselves to the ground just to get free floor mats. I dare you: Stand a post for one day in a busy car dealership. The public = nuts. The irony is that many people, begrudging the sales doofus his meager dimes, give away dollars. Car buyers routinely drive off the lot having spent way more money on wheels, horsepower, seats and audio than they ever intended. And the sales people don't have to do anything but hand over the paperwork. "The Audi S7 with the executive rear seating? Yes, sir, Mr. Neil! Right away!" Clap, clap! In retail sales, upselling is free money. Meet the King of the Upsell: the 2014 Ford Fiesta ST, a hot-hatch version of the company's megaselling global subcompact, now in its seventh generation. Sure, you walked into the dealership figuring on spending about $15,000 on the base five-door hatchback, but now the sales guy drops the ST on you. Boom! You love it. Because: fun. The ST scampers around town like a randy squirrel. Its 1.6-liter, four cylinder is turbo-boosted to the stars (21 psi) and redlines at over 6,000 rpm. It is shod with overachieving 17-inch Bridgestone Potenzas and?OMG! ?it's got an old-school six-speed manual transmission. The Fiesta is one of the world's best-selling cars. Engineered by Ford of Europe, it is basically the official car of every public servant, barmaid and shopkeep in the United Kingdom. Fiesta vacated the U.S. market in 1980 and returned in 2010. Ford moved the tin to the tune of 57,000 sales in 2012. So there is absolutely nothing wrong with the Fiesta in its less highly contented form: seven air bags, heated outside mirrors, Bluetooth and plug-and-play media with voice recognition, power windows and doors with keyless entry. But if you want to stave off long-term ownership ennui, the ST is the way to go. Now, there's a face you could wake up to in the morning. The ST package lowers the ride height a half-inch, stuffs the wheel wells with the big hex-motif alloy rims, and wraps special aero bodywork around the rocker panels, front and rear lower fascia. The blacked out, flush-fit grille and thick eyeliner around the headlamp assemblies actually give the ST a touch of the exotic. The Fiesta ST's taut modernist bod, bandy proportions and unsmiling, on-task visage help it avoid the box-office poison of cuteness. Think of it as a hot-hatch Aston Martin. But the abacus beads have moved, alas: The Fiesta of your dreams costs nearly $25,000, and that's without the sunroof. The optional Recaro partial-leather seat package takes a huge bite ($1,995) but the deep, bolstered buckets are so slaggingly futuristic and supportive, you can't give them up. It's nice that the Recaro package also includes heated front seats. The navigation system adds $795. The painted gray 17-inch rims with the thrombo red brake calipers, that's an additional $375. Of course you're going to spend the money, because you are only flesh and blood and because there are favorable lease terms available. I'm here to say, it's OK. Give in. Live a little. As a happy consequence of the company's One Ford global strategy, the U.S. market will get the ST in its full Euro-spec brattiness (the company's past practice with the Focus ST has been to offer North America dialed-down versions). The ST is almost exactly as sold overseas, with the heavy-breathing turbo stoking the all-aluminum 1.6-liter in-line four, whipping up 77 hp more (197 hp) than the base car. Max torque almost doubles, to 214 pound-feet at 3,500 rpm, but the car feels cammy and eager anywhere north of 2,200 rpm. Pin the throttle, grab a gear and the ST (2,742 pounds with the manual) takes off like a hooked trout, chuffing its front tires and flickering the traction-control indicator until you either shift or blow through the fuel cutoff point. The combination of big turbo boost and the small, lightweight crank gives the engine a deep suddenness, an eagerness to spool up. Even at low rpm, the engine pulls, and a sturdy, resonant exhaust note fills the car, a hummingbird on performance-enhancing drugs. In the interests of turbo (and warranty) preservation, the engine-control module dials back maximum boost after 20 seconds, but you need only a light lift of the throttle to reset the turbo timer, so the effect is practically unnoticeable. Shuffling through the short lower gears, drivers will find plenty of use for the car's brake-based torque vectoring on the front axle, helping put more power to the ground when accelerating out of corners. The Fiesta ST's electric steering is satisfyingly responsive, even a wee edgy with a surprising amount of tactile feedback from the front tires. The steering wheel is small and feels racy. The steel foot pedals are right where you want them for heel-and-toe footwork. Driving position is just excellent. The donor car's front-strut, rear-beam suspension has been modified in the expected ways: Damping and spring rates are up, front and rear, with a smaller front antiroll bar putting a little more danciness in the Fiesta's hinder. The Fiesta ST has what you might call entertaining body roll, like an old Alfa. And when the tiny hampster blood boils at 5 grand in this car and she's got a front wheel off the ground, I defy you not to smile. You can dive into a tight 35-mph curve, and when the front tires really start to complain, breathe off the gas gently, and the car will come around with a sweet, catchable trailing-throttle oversteer. When the little hood is pointing in the right direction, lay on the coal. The Fiesta ST claws away like a cat escaping a water pistol. It is all about shelf life. How many times can you walk out to the same car in the morning without being overwhelmed with boredom? 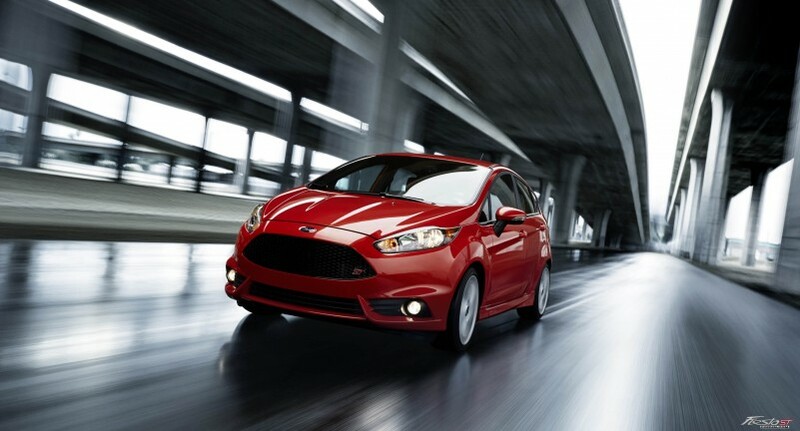 The Fiesta ST costs more, but it will keep owners smiling a lot longer. That makes it a bargain.